The theme of this year’s conference will focus on translational research including complex hearing loss, dementia, hearing aids and hearing implants. Delegates will get to explore how current research may fit into clinical practice within interactive sessions with today’s researchers in the field of audiology. As well as traditional conference lectures we will be hosting grand round sessions. We have all heard about ward rounds – where medics review each patient under their care to plan the care required. Grand rounds are a methodology of medical education based on this idea of reviewing an individual’s case; exploring the assessment and treatment options in an unusual or challenging case. During this grand round session we will explore how evolving research might be translated into clinical practice with a panel of experts. 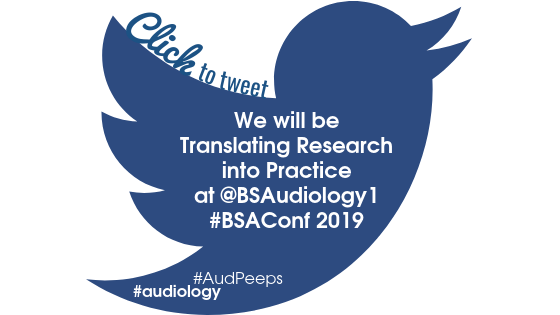 A key part of our BSA Conference is to share and learn from current research and developments in audiology across the UK and internationally. Presenting a poster at the conference provides the ideal opportunity to share your research, innovative developments or best practice and to network with colleagues. So why not showcase your work and submit an abstract for poster presentation? Email your title and abstract, 250 words maximum to jmcc@fitwise.co.uk by 30th April 2019.